Tips for your pets. Dogs and Cats! Shop at TagsforPets.com and get 20% OFF with this ad. Offer ends August 31st, 2016. Tips for You and Your Pets. Humans aren't the only animals that can find a hot summer day overwhelming. But unlike you, your pet has a limited ability to deal with the heat. Dogs release heat through their paw pads and by panting, while humans can sweat through all of the skin on their body. Dehydration can be a big problem for pets during the hot weather, too. According to the ASPCA, animals with flat faces—like Pugs and Persian cats—cannot pant as effectively, and are therefore more susceptible to heat stroke. You should also keep an eye on elderly or overweight pets or animals with heart and lung disease. In the summer, make certain that Fido and Fluffy always have access to plenty of fresh, cool water, and avoid letting them run around outside during the hottest parts of the day. Another summer pet safety issue is the presence of ticks and other summer insects. Not only can bugs carry diseases, but the ways people try to ward them off can also cause problems for your outdoor pet's health. Fertilizers and pesticides may help keep a lawn looking great, but they can be very dangerous for your pet. In the areas where your pets play, it's better to keep the grass cut short to reduce the presence of ticks and other insects. Also keep an eye out for fertilizer warnings on neighbors' lawns when walking your dog. 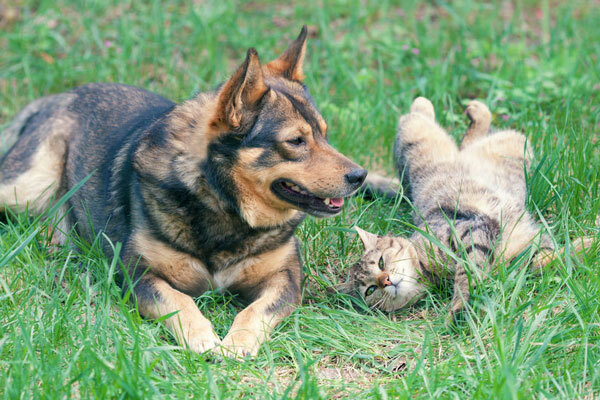 Talk to your veterinarian about the best ways to protect your pet from fleas, ticks, and other insects that are more prevalent during the summer months. In the summertime, antifreeze can leak out of cars when they overheat, leaving puddles on the ground that your dog can easily lap up and swallow. The sweet taste of antifreeze is tempting to dogs and cats, but when this toxic substance is ingested, it's potentially lethal. Pay attention to your neighbors' cars and puddles on your street, and make sure your pets stay clear of it. Find out if your pet needs sunscreen. Some pets, particularly those with short fine hair and pink skin, can be susceptible to sunburn. Talk to your veterinarian about which types of sunscreen are safest on your pet's skin, and follow up by routinely applying sunscreen as part of your summer routine. Do not use sunscreen or insect repellents that are not designed specifically for use on animals. The ASPCA says ingesting certain sunscreens can cause drooling, vomiting, diarrhea, excessive thirst and lethargy in pets. As with other aspects of summer pet care, water safety is all about thinking ahead. Although it's fun to bring your pet to the beach or pool to stay cool together, always keep a close eye on your pet when they're in or near the water. Even a strong swimmer could have trouble getting out of a pool, or get trapped by ropes and other obstacles. For more risky summer adventures with your dog, like boating, look into a doggie life preserver. It could prove to be an excellent investment for his safety. Summer pet safety isn't hard, it just requires some thought and attention. Watch over your pet the way you would a small child—protect them from too much heat, sun, and other summer dangers—and everything should be just fine. © 2016 American Pet Classics.